I really enjoy trying to show opposites in my photographs, and this one does that with regards to time. 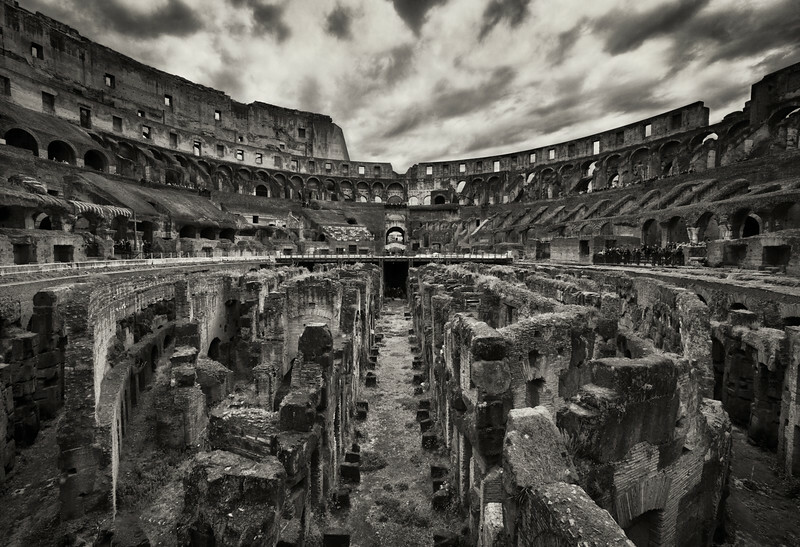 The ancient and magnificent Colosseum stands in the middle of modern day Rome, surrounded by people, technology, and roads. Most pictures don't show just how close the Colosseum is to the major roads around it, but I tried to show that here. 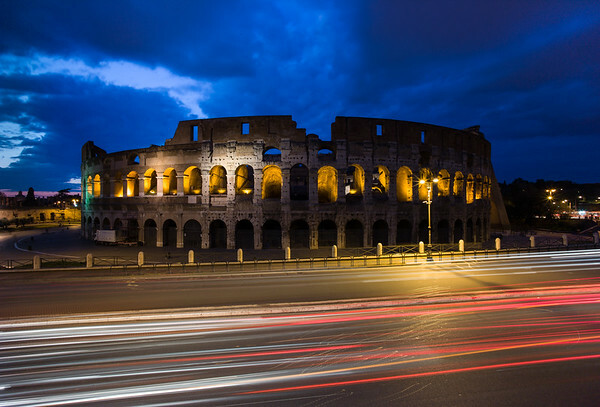 Setting up as the sun was going down, I used a long exposure to capture the head and tail lights of cars driving past the Colosseum; you can even see the what it looks like when some cars change lanes. Wouldn't it be amazing to drive by this every day? I don't think it would lose any of its wonder or magnificence. This young couple is caught kissing on one of the many bridges over the Tiber River that snakes through the middle of Rome. I saw this scene unfolding and got into the right position to capture the kiss, the angle statue watching over the couple, and the dome of St. Peters Basilica in the background. It was a fleeting moment before the kiss was over and other people walked into the scene. I couldn't have planned this any better, and even the moody clouds cooperated. 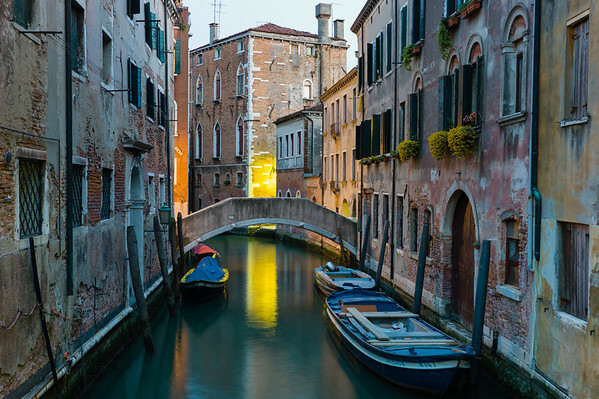 Late in the evening, just before the sun set over the city of Venice, I was out scouting new locations when I came across this beautiful canal. This canal isn't much different than the thousands of others in Venice. Like so much else in Venice, it was the color and textures that captured my attention, drew me in, and required me to set up my tripod for this 6 second shot. Not only does the last remaining natural light illuminate most of the scene, but a canal light provides a golden yellow in the middle, highlighting more depth and reflections. The exposed bricks on either side of the canal, along with the faded colors of the buildings, shows off the old, weathered, and beautiful texture in the frame. Inside another unique Athens church, one of many I visited during my few days in the Greek capital. 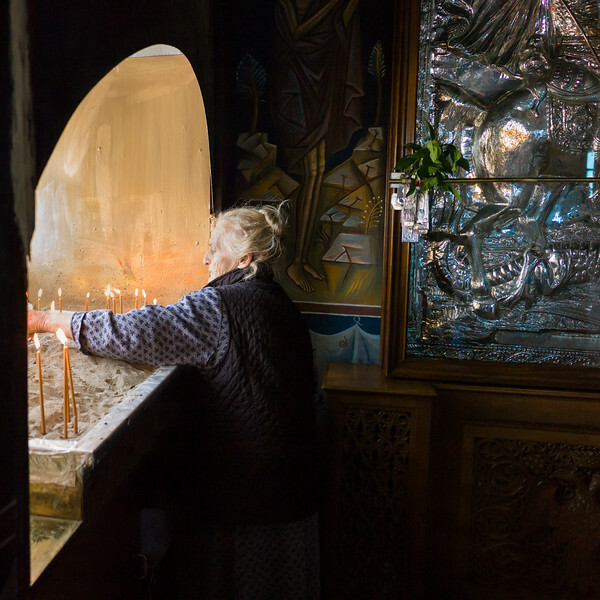 What attracted me here, beside the woman going about her rituals, was the beautiful richness of the alcove, lit not just by the candles but also by natural light streaming in from a window. The natural light provided just enough illumination to see the murals on the wall and the hand-hammered tin behind the woman. The sun rose early this day, and given the opening hours of the Acropolis I couldn't be there at the actual time the sun crested the horizon. Working my way quickly to the top of the Acropolis complex, I got there in time to get the sun just as it was positioned behind this ancient Greek column. The high, thin clouds in front of the light blue sky is what makes this image for me. 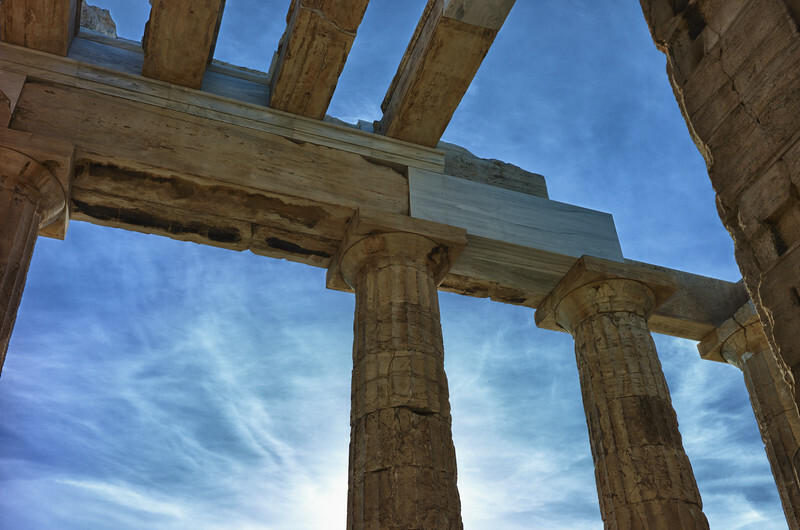 The Acropolis has been photographed since the beginning of photography, and while the structure has remained the same, it's the clouds that change and make each image unique. I spent days walking around Rome. The skies were clear, the temperature was perfect, and Spring was beginning to show itself. It's hard to to capture great street photography scenes in Rome, as long as one keeps their eyes open, which I try to do. 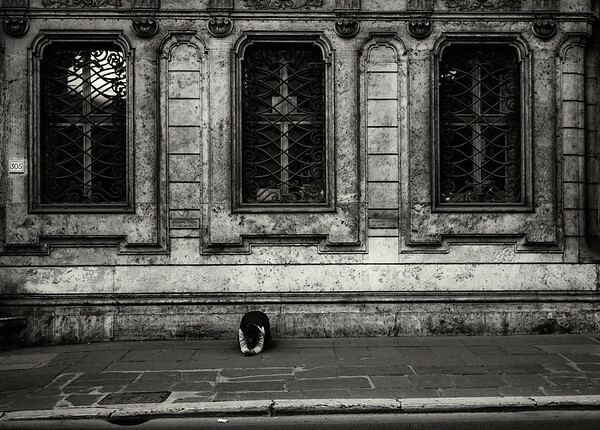 From across the street I saw this homeless woman prostrating in front of a building. I'm not sure if that building is a church, though the windows make me think it is. She kneeled there, on this gently sloping main thoroughfare of the ancient capital. The building had a certain gritty texture and look to it, which was accentuated with the conversion to black and white. One of the things I love about photography is that I can plan my shots, be in certain places at certain times, and have all the right gear. But, none of that will account for random scenes that appear at the most unlikely of times and places. 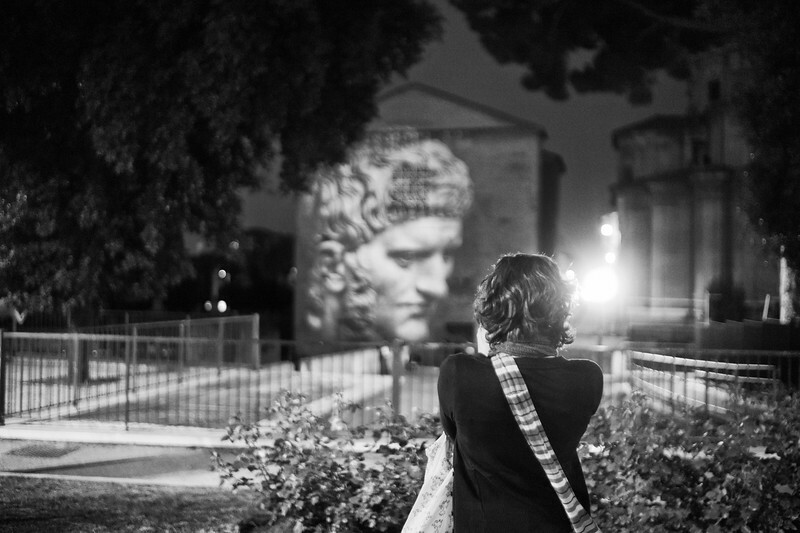 Late one evening, walking back to my hotel after dinner and a day of exploration, I saw this young woman standing in front of the Roman Forum, staring at the projection of an ancient Roman statue. I had the right fast lens on the camera already, and quickly moved into position to get this frame before the woman moved. I love the fact that the statue appears to be staring at the woman, as much as she is staring at it. Given the late hour, I saw this image, even before pressing the shutter, in black and white. It just works better as a monochrome. 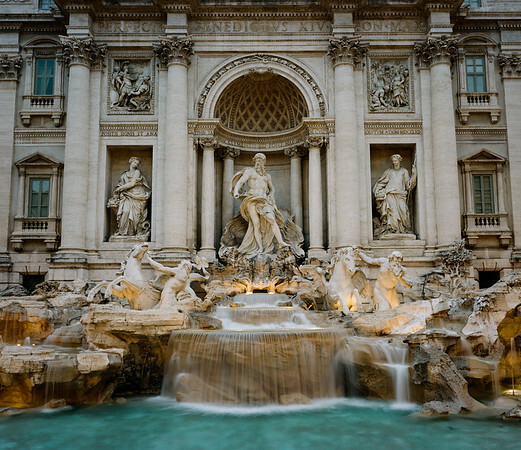 Trevi Fountain is one of the most visited sights in all of Rome. Show up there anytime between 8am and 9pm and you'll be fighting to get close to the fountain and surrounded by thousands of tourists. That's how i first experienced Trevi, though even then the magnificence of the fountain can be felt and seen. The next morning, before the sun rose, I was back at the fountain. At the early hour of 6am I had the fountain to myself, with only one or two other locals walking by infrequently. For the next hour I enjoyed photographing the fountain from different angles, using both my Leica digital and medium format film cameras. This was one of the last images I captured before just sitting down and watching the water stream down the fountains terraces. Over the next thirty minutes I did something that I often overlook when out taking images: just lowing down and enjoying the scene. I watched the sun rise above the buildings, the number of people increase, and the sounds of the city grow as it woke up to begin another Spring day. Mamiya 7ii, 65mm Wide Angle lens, Kodak Portra 400. I normally don't mix black and white with splashes of color; usually it's one or the other for me. 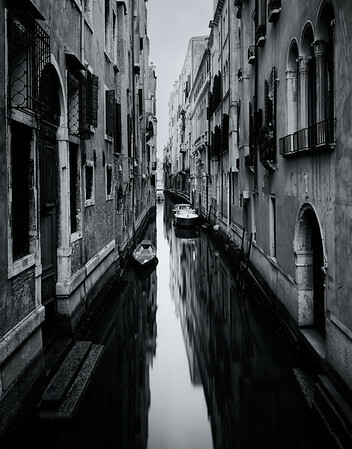 But, in this instance I loved how the scene looked in black and white, which brings out the Venice-feel. After a continuing to tweak the image for a while, i decided that having the flag in color highlighted the traditionally-nature of Venice with the colorfulness that one experiences throughout the city. Mamiya 7ii, 65mm Wide Angle lens, Kodak Portra 400 film. 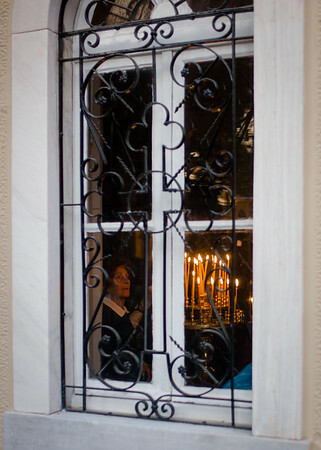 The countless churches of Athens always have interesting things going on in and around them. Whenever I walked past one I had to take a quick peek inside, or at least see what was going on through the windows. That's how this image came about, just walking and looking. The candles caught my eye, and then the woman moved into the frame, which was almost perfect. Can't remember where in Athens this was taken, but I'm sure I had a great time getting it. 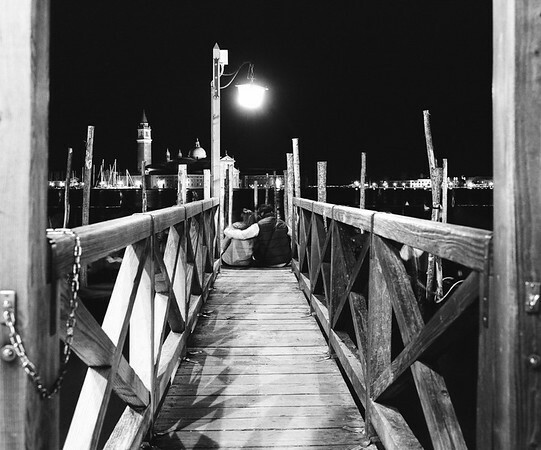 Illuminated by just two street lamps, it was nearly pitch black out the night I took this image in Venice. 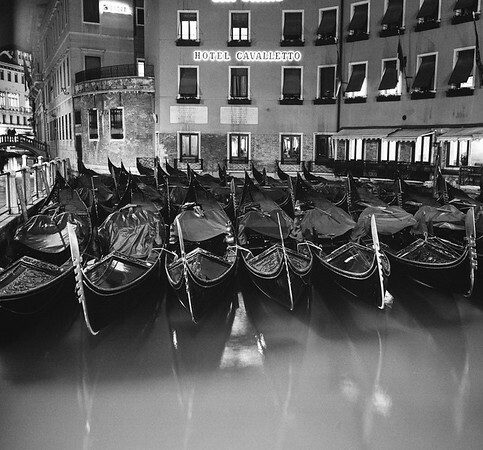 I'd enjoyed a great Italian dinner, and had spent the next few hours exploding the area around S.t Marks square when I walked out to the water from and the docks used by the gondolas. I found this young couple sitting at the end of the dock, deep in conversation, and captured this frame using my medium format camera. Given how dark it was, I shot with the aperture wide open and focused on the couple; this resulted in the closer parts of the dock being slightly out of focus, which I really like. Mamiya 7ii, 65mm Wide Angle lens, Ilford HP5+ 400 film. 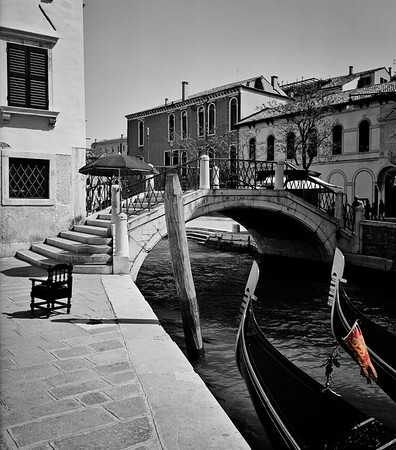 What happens to all the gondolas when the gondoliers retire for the night? This is what happens. They are navigated towards a small area where they can be docked and covered for the night. I honestly didn't expect this, and almost laughed out loud when I turned the corner and saw this sight. Everything was perfect--so still and calm, not crowded, and very quiet. I loved it. So, after sitting there for a few minutes just taking the scene in, I set up my tripod and captured a few images. Myamia 7ii, 65mm Wide Angle lens, Ilford HP5+ 400 film. 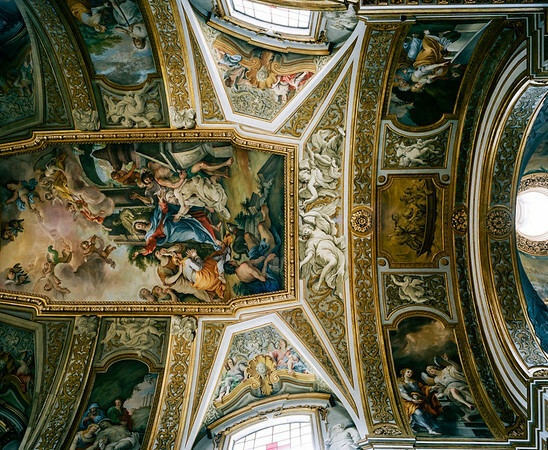 While in Italy I became fascinated with the ceilings of churches. I think the grandeur of the walls, floors, windows and alters of these churches can make one forget to look up and soak in the intricate ceilings. Without being able to use a tripod, and with the interior of must churches being quite dim, I got quite adept of placing my camera on pews, railings and floors, pointed straight up at the ceilings, and used the self-timer to capture the images. This was somewhat simple with a digital camera, but when using film cameras it wasn't until weeks later that I would discover if my efforts were successful. When success came, it was beautiful and rewarding. Mamiya 7ii, 65mm Wide Angle lens, Kodak Portra 400.